Goaltender Jared Schletty came up with several big saves against Hill-Murray in the Section 4AA final (Photo by Tim Kolehmainen). Brandon Wahlin was first out of the locker room. He had his hockey bag slung over his shoulder and immense satisfaction on his face. The White Bear Lake senior co-captain had, after all, just played into double overtime against arch rival and No. 1-ranked Hill-Murray in the Section 4AA championship game at the State Fairgrounds Coliseum. The Bears beat the Pioneers 5-4, ending a 14-game winless skid to their northeast suburban rivals dating to 2004. Except this is Minnesota high school hockey, and there’s no better March destination than the state tournament at the Xcel Energy Center in St. Paul. The party won’t last long. As Wahlin pointed out, White Bear Lake has yet another gorilla sitting squarely atop its shoulder. The Bears, amazingly, have gone 0-for-17 in the opening round of the state tournament going back to their first appearance in 1945. 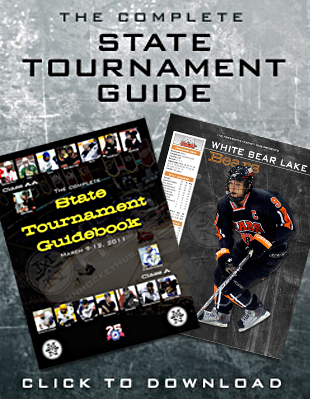 Unseeded White Bear Lake (21-5-2) plays No. 3 Duluth East in (22-5-0) in a 1 p.m. state Class 2A quarterfinal matchup on Thursday, March, 10, at the Xcel Energy Center in St. Paul. Duluth East beat White Bear Lake 5-2 on Friday, Dec. 10, at the Vadnais Heights Sports Center. It’s an encouraging sign for the Bears that Wahlin, one of their inspirational leaders, wasn’t merely satisfied with pulling off one of the biggest upsets in recent section playoff history. After all, it’s easy to forget the 1980 “Miracle” USA hockey team still had to beat Finland for the gold medal after stunning the great Soviet Union juggernaut. Before heading into the second overtime against Hill-Murray, the Bears were sprawled on their locker room floor. “We lifted our legs in the air to get the lactic acid out,” said Wahlin, who leads the Bears with 58 points. 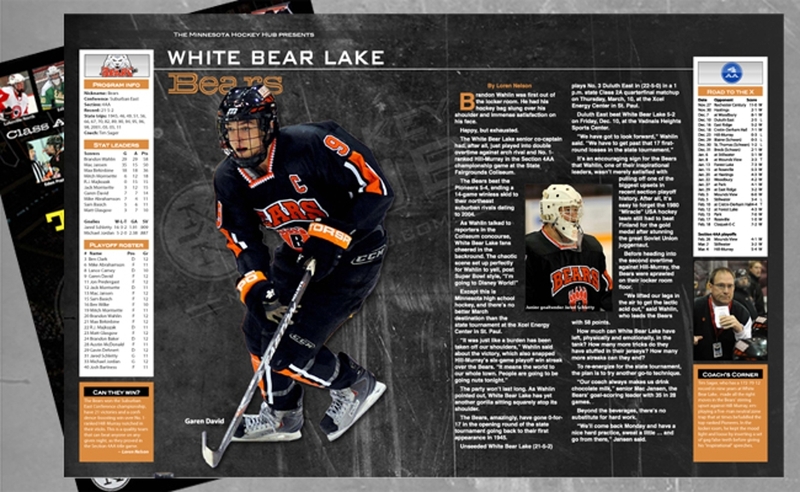 How much can White Bear Lake have left, physically and emotionally, in the tank? How many more tricks do they have stuffed in their jerseys? How many more streaks can they end? To re-energize for the state tournament, the plan is to try another go-to technique. 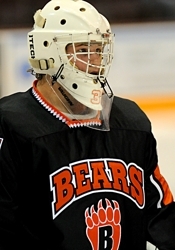 “Our coach always makes us drink chocolate milk,” senior Mac Jansen, the Bears’ goal-scoring leader with 35 in 28 games. Beyond the beverages, there’s no substitute for hard work. “We’ll come back Monday and have a nice hard practice, sweat a little … and go from there,” Jansen said. The Bears won the Suburban East Conference championship, have 21 victories and a confidence-boosting win over No. 1-ranked Hill-Murray notched in their sticks. This is a quality team that can beat anyone on anygiven night, as they proved in the Section 4AA title game. Tim Sager, who has a 172-70-12 record in nine years at White Bear Lake, made all the right moves in the Bears' stirring upset against Hill-Murray, employing a five-man neutral zone trap that at times befuddled the top-ranked Pioneers. In the locker room, he kept the mood light and loose by inserting a set of gag false teeth before giving his "inspirational" speeches. White Bear Lake, two nights after a stunning section final upset of Hill-Murray, once again celebrated around a trophy. The varsity team attended a local Squirt A team’s district championship game and cheered the younger Bears to victory. After 14 consecutive losses to rival Hill-Murray — six in the playoffs — White Bear Lake erased seasons worth of frustration with a 5-4 double-overtime victory against the No. 1 ranked Pioneers. Now the Bears (21-5-2) are the toast of the town and back in the Class 2A state tournament for the first time since 2005. They begin play at 1 p.m. Thursday against No. 3 seed Duluth East (22-5) at Xcel Energy Center. Some immediate success in the state tournament also would serve the Bears well. The program is 0-17 in quarterfinal games dating to 1945, a statistical oddity some call a curse. Current players refuse to let history impact the present. This team faces its own challenges. Two emotional section playoff overtime victories against Stillwater and Hill-Murray took a lot out of the Bears. Now they must refocus on Duluth East, a team that beat the Bears 5-2 at their rink in December. The process of developing into a strong postseason team began soon after. Young players improved. Lines were juggled. And bonds were strengthened. Last season, a hazing incident led to 10 players getting suspended for two weeks. This season, players are going to dinner, having sleepovers and being ambassadors at events such as the Squirt A district championship game. White Bear Lake coach Tim Sager said of last season, which culminated with an embarrassing 5-1 playoff loss to Hill-Murray, “bygones are bygones.” But the on- and off-ice struggles led to a renewed energy. Sager’s seasonlong mantra to play with intensity, integrity and to be a good teammate paid off against Hill-Murray. Birkinbine’s goal just 31 seconds into the game gave the Bears their first lead in a game against Hill-Murray since 2008. Players threw themselves into blocking shots. And when a 4-1 Bears lead became a 4-4 tie, no one panicked. Jansen, a lifelong Bears fan who cheered the Bears at state in 2005 in a quarterfinal loss to Duluth East, said players plan to give of themselves again on Thursday.